FenwayNation—Red Sox, Mookie, J.D., Bogaerts, Sale, JBJ—Founded 1/27/2000—9-Time Champs: 30% Cyber Monday Savings Extended To Tuesday For Fanatics Sox WS Gear! 30% Cyber Monday Savings Extended To Tuesday For Fanatics Sox WS Gear! If you missed out on the 30% off savings yesterday on Red Sox World Series Championship gear, we have some good news for you! Fanatics.com has extended the Cyber Monday savings on all orders through today—Tuesday. That's right, by ordering through FenwayNation, you can score 30% savings on all Red Sox World Series gear. From "History Made" t-shirts to World Series Champion hats of various styles to official World Series Champions Team Logo Player Jerseys—you can buy them all right here! You can even score the World Series DVD—which is always hard to find elsewhere. And, keep checking for extra-special savings offers that pop-up from time to time. So come on, get it into "gear" and buy all the World Series stuff you can—and don't forget that WS stuff makes a great Holiday gift. Hey it's November 27th already—the Holidays are literally already here! 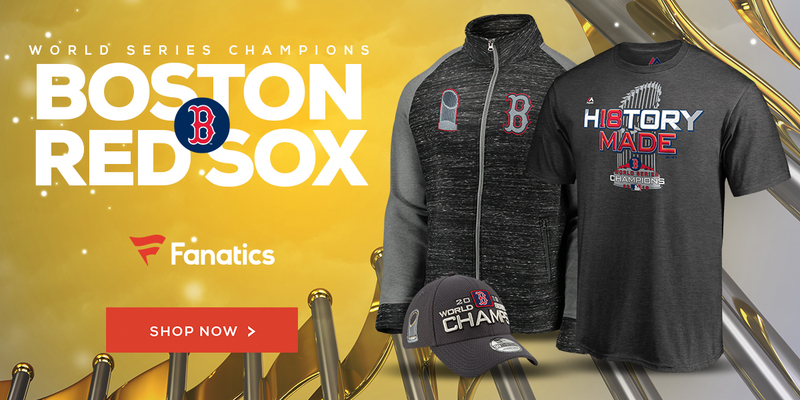 You can purchase all this great Red Sox championship merchandise by clicking HERE.